We love candles. They provide atmosphere, and make a room smell wonderful. 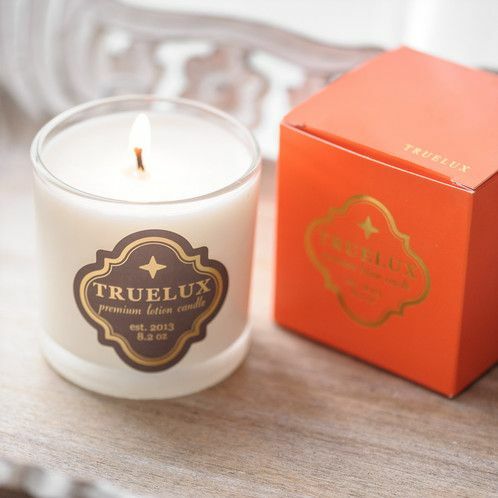 But Truelux Candles are even better than regular candles, because you can use them as a lotion too! How clever is that?! These are hand poured candles scented with essential oils, and thanks to a special blend of cosmetic grade soy, shea and mango butters, and oils, they burn at only two degrees above body temperature. Light the candle, and allow it to melt to the edge of the glass container. Then just dip a finger in the melted portion, and you’re rewarded with a warm lotion that is so luxurious, you only need a drop or two to hydrate your dry winter skin! The candles last 40-60 hours and are recommended to burn at not more than 4 hour intervals. Choose from scents like soothing vanilla or lavender or an invigorating scent like coconut lime. Double benefits with the Truelux Candles!